If you're looking to save cash after dropping some change on the new iPhone 5, third-party Lightning adapters aren't the way to go. Thanks to the dissecting handiwork of Peter - owner of Double Helix Cables, a cable speciality website - we now know Apple's new Lightning cables come with what he called a "mystery chip," something he said looks like an authentication system. Though he doesn't know what the chip does exactly, he said the cable won't work properly without it. This means any unauthorized third-party charging accessories are currently useless. The chip is nestled between the adapter's USB contact and the power pin in the cord. Peter, who, citing privacy concerns, declined to give his last name, said the chip might be used for something other than authentication, such as to regulate power. The chip is pretty fancy, though, with a mirror-shined metal exterior and laser-etched numbering. 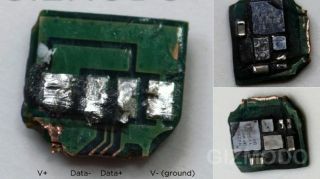 "At this point the chips could do just about everything, [but] what we do know is that the chips are only interacting with the V+ USB line [USB being data+, data-, V+, V- (ground)]," Peter told TechRadar in an email. "The other three wires of USB go directly to the end of the Lightning plug," he continued. "The one thing that is almost certain is that they're proprietary [and] custom designed by Apple, and the cable won't work without them." Authentication chips are nothing new, but most of the time we see them in higher end accessories. This marks one of the first times a chip of this kind has appeared on a basic connector cable. Apple made quiet a stir when it announced it was changing its long-used 30-pin connector port for the iPhone 5. With the new Lightning connector costing about $29 (£18) each, iPhone 5 users are no doubt looking for something a little cheaper. Even before the iPhone 5 launched, we were seeing third-party adapters being offered on Amazon by companies such as Nanotch and iTronz. Those companies were selling adapters from $9.99 (about £6) to $17.95 (about £11). Peter warned that any kind of third-party Lightning adapter without the chip probably won't perform. "There is basically no way those are functional cables," Peter told AppleInsider. "You can't just build a Lightning cable by making something with the same shape and connectivity, and my teardown proves that. The chip has to be there, and it is directly in the signal path of the V+ wire." The new chips, then, will give a headache to anyone who's trying to sell knock off Lightning adapters without Apple's permission. However, it may only be a matter of time before someone cracks the connector, Peter said, and he wouldn't count out unauthorized manufacturers from being successful at duplicating Lightning just yet.